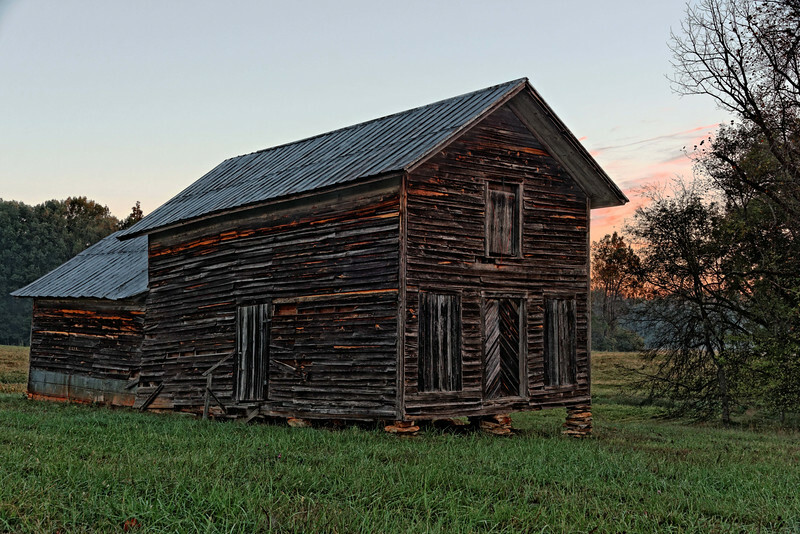 In October 2014, I took a photo safari to Appomattox, VA. On the way, I took some shots of old barns and buildings that you will see at the beginning of this gallery. I had never been to Appomattox and wanted to see the McLean House where Lee surrendered to Grant and the National Park at the site. I did not attempt to take every building in the park but focused on those that most interested me. You will find titles below each picture if you click on the large picture on this page and then click on the arrows to scroll through the photos. Upon leaving Appomattox, I drove to Pamplin City, VA, about 20 miles southeast. Pamplin, population 216 in 2010, was once a classic railroad boom town. The Pamplin Pipe Factory, once the largest producer of clay pipes in the world, was headquartered there. The town fell on hard times with the decline in railroad traffic. The former main street, which sits by the train station and beside the railroad tracks, is now a "ghost" downtown, with all its former businesses vacant. A resident told me that the downtown district just folded in 1989. Articles on the Internet indicate that residents are trying to revitalize the town. Pamplin is much like Thurmond, WV, which you can see in my New River Gorge gallery and the West Virginia Safari gallery.